Unsure how to properly represent your company? Google has some great guidelines for representing your business in search results. You can find your Local SEO Settings by going to SEO → Local SEO. There are a number of settings and they depend on whether your business has a single location or multiple locations. Enter your longitude and latitude details. If you are not sure what they are, we suggest leaving it blank and allowing the plugin to automatically calculate it for you. You can set a business image that represents your company, like your company logo. This business image is used for the schema.org markup. It will not be visible for visitors. If you want to make a logo appear for your visitors go to SEO-Search Appearance-General-Knowlege Graph and select Company. Then set the logo. It is OK if both the image and logo are the same. The advanced settings section comes with seven settings. Unit System: This option is used to output the system when calculating distance. Location Detection: Automatically detect the users location as starting point. This is only available for secure websites using https. 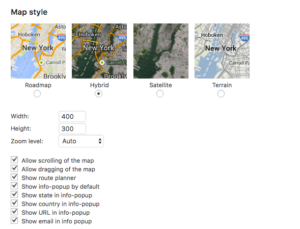 Default Map Style: This option specifies the default display of the map. Address Format: Select the right format for your address. 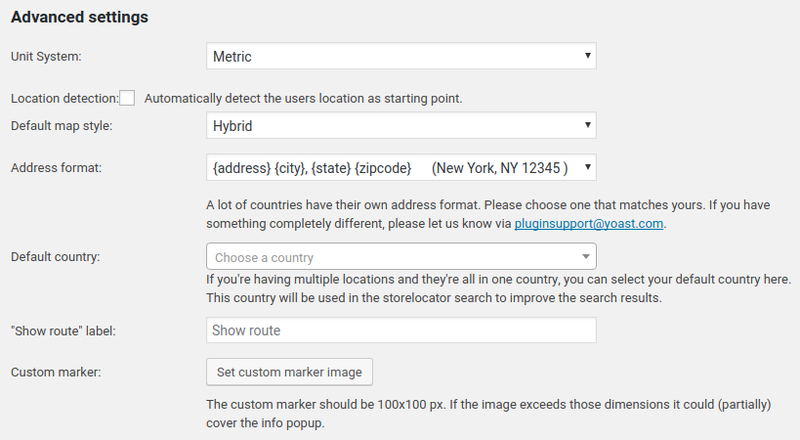 Since different countries display addresses differently, we ask that you contact pluginsupport@yoast.com if yours is not listed. 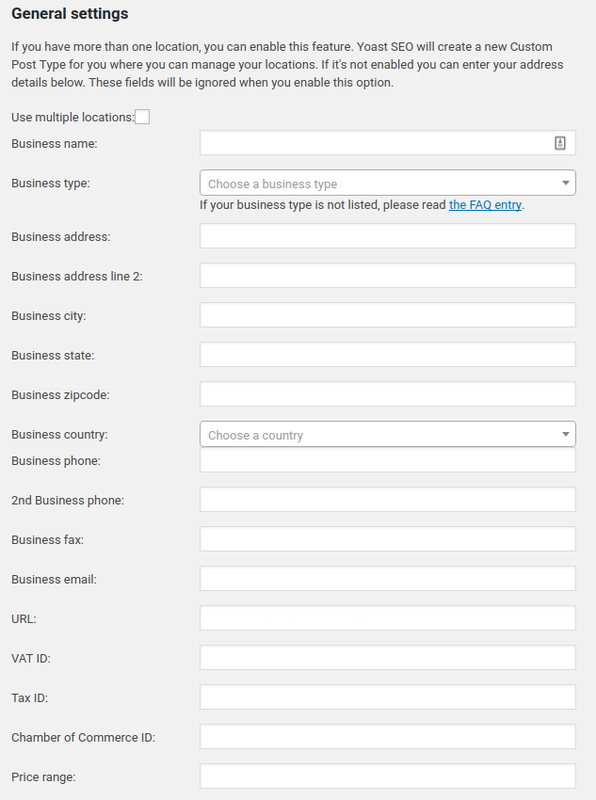 Default Country: Select the country your business resides in. "Show Route" Label: This option allows customization of the default label that appears in the show route box. 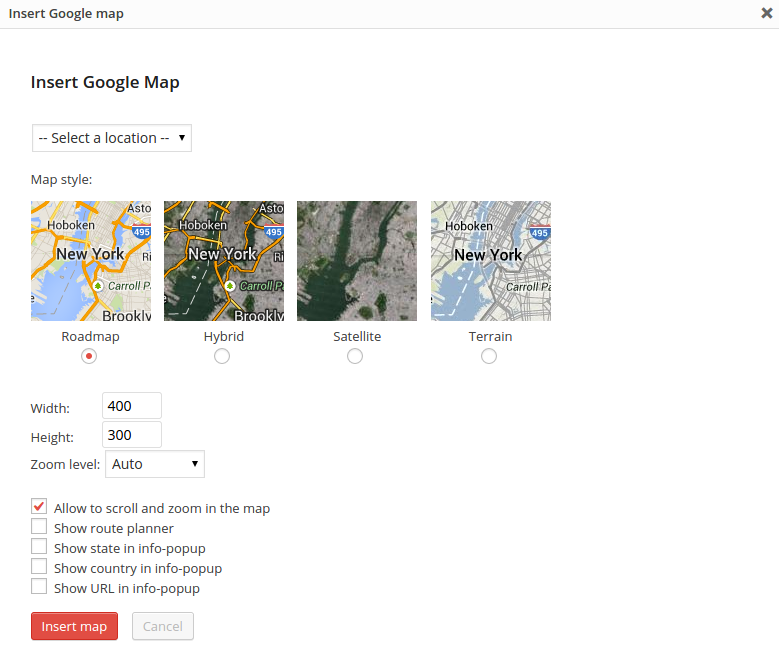 Custom Marker: This option allows a custom map marker to display instead of the default Google map marker. If you have multiple locations, please tick the checkbox in the Local SEO settings and save the plugin settings to enable this feature. Advanced Tip: You can customize the slugs and labels to match your niche. Now all your location details are stored as Custom Post Types. On the left-hand side, you will see a new menu item. Click on 'Locations'. Click on 'New Location' and enter the details for the location. This will serve as a landing page for the individual location. Customize the page with information about your location. Shortcodes are available for your convenience. 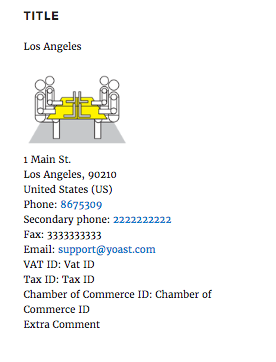 In the multiple location Business Details section you will have five different subsections . This option allows you to copy data from another location. You will need select your business type that best describes your business. If you do not see you business type, we suggest selecting "Local Business". Then fill in the other information about your business. Note: Price Range can be either a currency type such as $ or $$. It may also be a range such as 6-9. This section is used to specify your exact location. If you are not sure, leave it blank and the plugin will automatically calculate it. This section allows you to drag exactly where you want your marker to be. 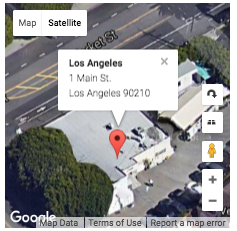 You can also set a unique logo and map marker for this business. Your map marker should be at least 100px x 100px. 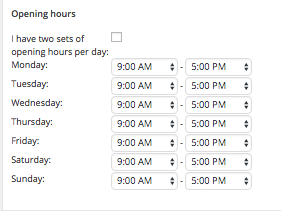 This section allows you to customize the hours of the business. 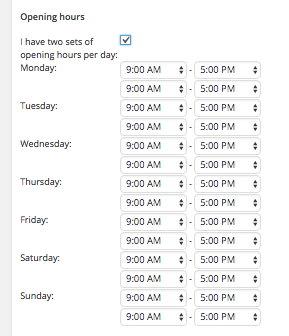 If you have two sets of hours a day, enabling that feature will provide additional times for each day. 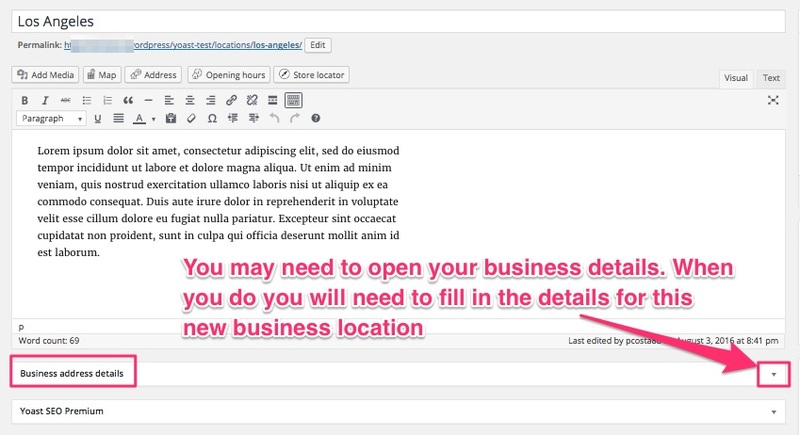 If you want to use the 24hr format or hide the opening hours option, you can enable it by going to SEO->Local. 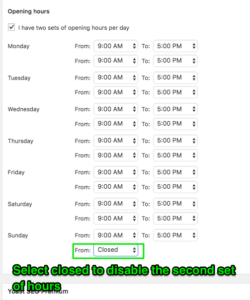 To disable the second set of hours (perhaps your business has two sets of hours everyday except Sunday) select "closed" from the second set of hours. 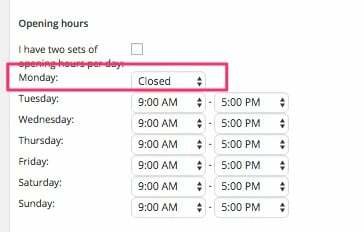 On the front-end you can expect the second set of hours to not appear. Note : If you've previously entered the location details as a single location, these locations details will be ignored. Make sure you enter all your locations in the Locations section. When multiple locations are enabled options to edit the slug (part of the URL) and labels will appear. We suggest customizing them to match your niche in the Local SEO settings. The slug for your location pages. Default slug is locations. Therefore you can find all the locations onhttp://example.com/locations/. If you change it to, let's say, "stores" the URL to view them all will be http://example.com/stores/. 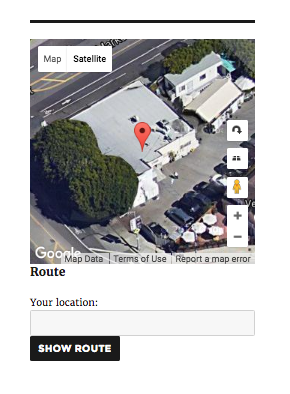 The singular label for your location pages. Default label is Location. The plural label for your location pages. Default label is Locations. The slug for your location categories. Default slug is locations-category. 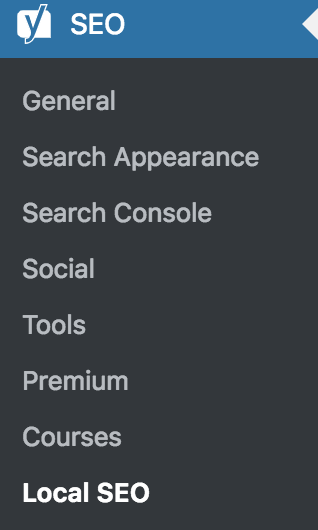 If you change it to, let's say, "stores-category" the URL to view them all will be http://example.com/stores-category/. This slug must be unique and not used elsewhere in your site. 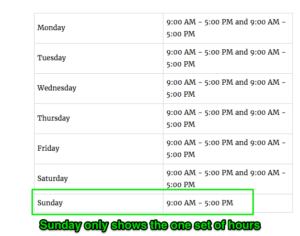 By default the opening hours are displayed in am/pm time format. If you want to use the 24 hour format, please check this on the settings page. 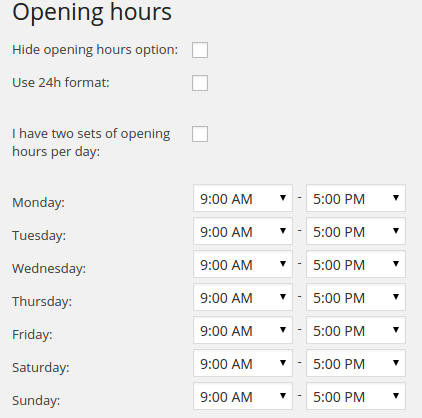 Also, if you have two sets of opening hours per day, you can check that option as well. If you are closed be sure to select that option in the drop-down menu. 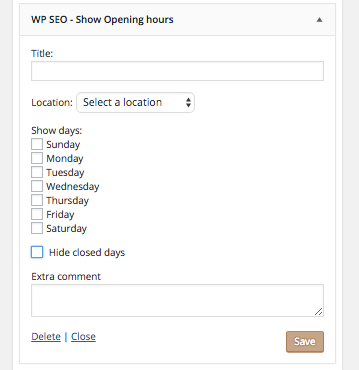 To show the opening hours on your website you can use a widget or shortcode. 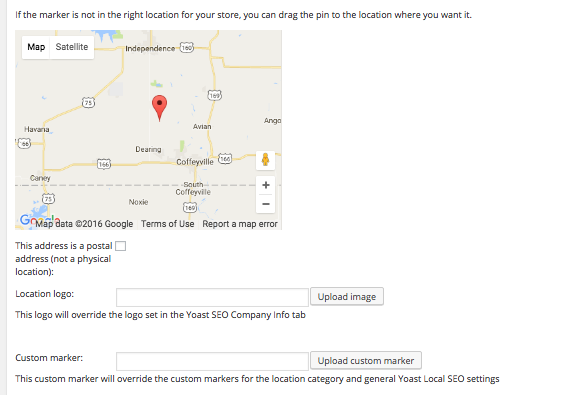 If you have a single location, you can enter the details on the Local SEO settings page. You don't have to submit the geo-sitemap to Google Search Console (former Google Webmaster Tools) yourself. The plugin automatically adds it to sitemap_index.xml, so all you have to do is submit sitemap_index.xml to Google Search Console (former Google Webmaster Tools). Which you probably already did! But if you haven't, please follow the steps here. You can view the widgets by going to Appearance->Widgets. These widgets may be used to display to address details or a map (we're using Google Maps for this). Note: The location dropdown list will only be visible if you've set more than one location. You will need to select a location from the drop-down menu.The map widget allows complete customization. By selecting the boxes you can customize what exactly is displayed. The options listed in the location widget are self-explanatory. 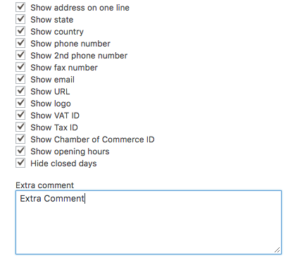 The extra comment section about the bottom may be useful if you have unique information about your business your customers need to know such as parking, gate entrances, or a door buzzing procedure. The map widget controls how the map is displayed. All Locations By selecting "Show all Locations", the map will show all your locations rather than the one specified in the drop-down menu. Zoom Level Zoom level controls how the map is viewed. 1 is the farthest away and 21 is the closest. Show State, Country, URL Enabling "Show State, Show Country, and Show URL" in the info-window provides some additional information for users when they click on the map marker. The default info-window displays the address, city, and zip/post code. This widget shows your opening hours. 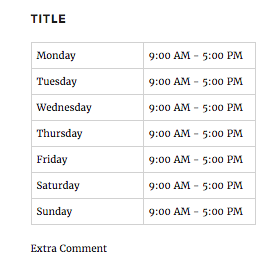 Extra Comment is useful for displaying extra information about your hours such as extended hours, special hours, closing early etc. With some pagebuilders you may be able to embed a Local SEO widget instead of using a shortcode or a button. Consult your pagebuilder's plugin or theme authors for more information on how to embed a widget. Map, Address, Opening Hours and Store locator information can be added through the use of a button. These buttons will appear across all posts, pages, and custom post types. When clicking the 'Map' shortcode button the following popup will appear. If you use multiple locations be sure to select the right one from the drop-down box. As you can see, this is really easy to use! Just select and set everything the way you want! And this map is actually responsive as well, meaning it will resize based on your browser/screen size! 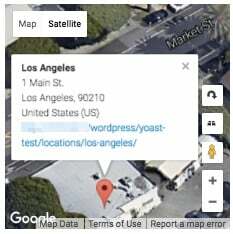 If you want to see what they look like live, you can see them on our Local SEO demo site: https://local.yoast.com/maps-examples/ You can also add the map using non-button shortcodes too. When clicking the 'Address' shortcode button it will show this popup. You can also add the the address shortcode using a non-button shortcode too. If you use multiple locations be sure to select the right one from the drop-down box. You can also customize it to display the kinds of information useful for your customers. When clicking the "Opening hours" short code button it will show this popup. 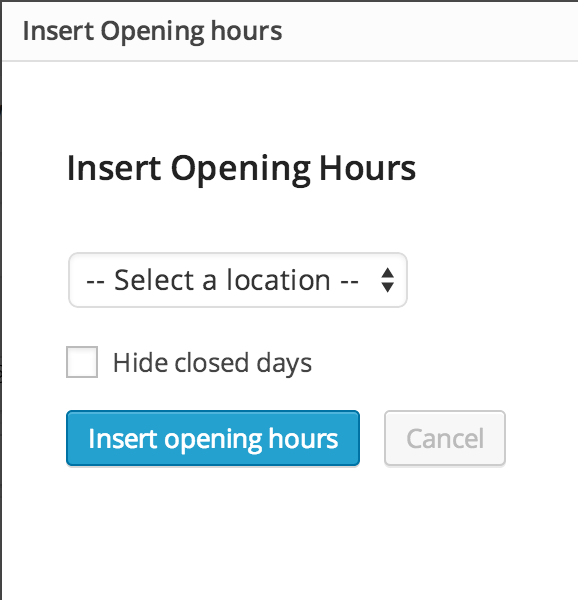 You can also add the opening hours using a non-button shortcode too. If you use multiple locations be sure to select the right one from the drop-down box. comment: Need to enter information. Any information entered between the " " will be displayed. 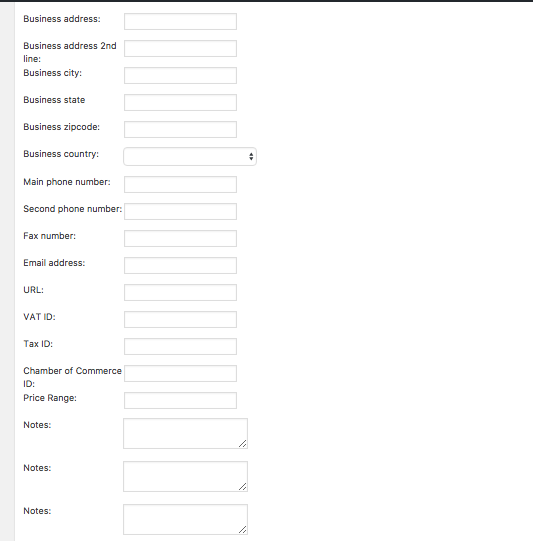 Two other parameters if used will result in the business name and the business address from not displaying. hide_name: true/false. Whether to display the business name or not. hide_address: true/false. Whether to display the business address or not. Full example using all parameters: Using a one "1" or the word "true" makes the parameter appear. Using a zero "0" or the word "false" makes the parameter not appear. Hiding Business Name and Address are not shown in this example. width: number in pixels. Default is 400.
height: number in pixels. Default is 300.
zoom: number of zoom level. Default is 12. Higher number means more zoomed in. scrollable: true/false. Whether to make the map scrollable or not. draggable: true/false. Whether to make the map draggable or not. show_route: true/false. Default to true. Whether to show a form field for using a route planner. Show_state: true/false. Whether to show the state in the info window or not. show_country: true/false. Whether to show the country in the info window or not. show_url: true/false. Whether to show the url in the info window or not. show_email: true/false. Whether to show the email in the info window or not. default_show_infowindow: true/false. Whether to show the info window automatically or not. Full example using all the Map shortcode parameters:Using a one "1" or the word "true" makes the parameter appear. Using a zero "0" or the word "false" makes the parameter not appear. hide_closed: Whether or not to hide days you are closed. Defaults to 0 which shows closed days. Change to 1 to hide closed days. show_days: Determines which day(s) are displayed. Defaults to all days of the week. Customize by entering the preferred days in a comma separated list. Use lowercase for name of days. comment: Adds a comment to the output. This comment is visible on the front end of your site. Defaults to empty. Enable/Disable: let’s you activate or deactivate this shipping method. Checkout text: is a text that is shown during the checkout process. It could provide some information for your customers on the process after the order has been completed. Like: ’You will be notified when your order is ready for pickup’. Local pickup costs: Sets the costs ( if any ) for shipping the order tot hat specific location. Use a positive floating or integer value without taxes here. Costs per category: enables you to activate and set the costs for all locations inside a specific location category. Costs per location: enables you to activate and set the costs for specific locations. Important: Your location specific setting will always override the category specific settings for that location. This plugin makes WooCommerce's Local pickup shipping method superfluous. 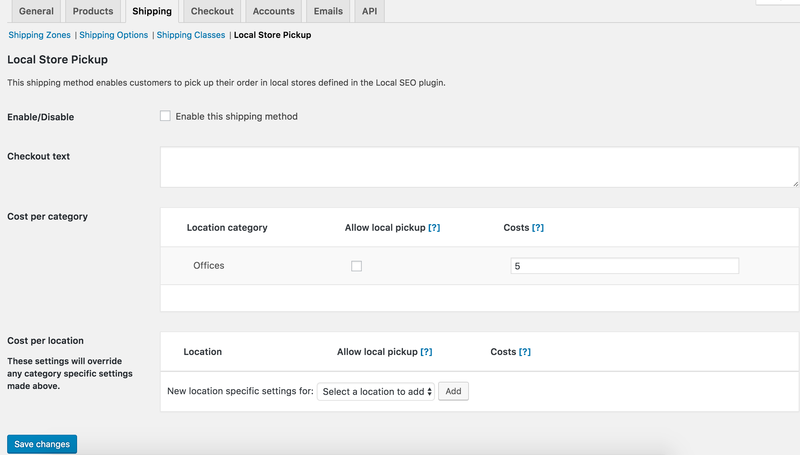 If you already configured WooCommerce to use it, you will be prompted to disable it when you have enabled Local Store Pickup shipping method. If you hadn’t configured WooCommerce to use it we disabled the visibility of that shipping method for you and you can’t configure it anymore until you disable Local Store Pickup as a shipping method. Transporting: means that your order has been shipped and is currently in transport tot he local store. Ready for pickup: means that the order has arrived at the local pickup store and can now be picked up by the customers. This overview shows a list of all orders that need to be shipped to a local store and has either one of the following statuses: “Processing”, “Transporting” or “Ready for pickup”. From this overview you can update the status of a specific order to one of the following statuses: “Processing”, “Transporting”, “Ready for pickup” or “Completed”. Once a customer has pick up his order from the local store you can set the status to “Completed” and the order will disappear from this overview. If you have enabled and configured the locations and the shipping method correctly The location will appear as a shipping option during the checkout process. We have altered the regular checkout process when using a local store pickup to make it more logical for our purpose. We removed the “Shipping address” from the overview. We don’t need it anymore since we are shipping to a local store. $slug = ! empty( $options['locations_slug'] ) ? You can adjust the size of the Route title name that appears beneath the Google Map. By default it is set to an h3 title tag. You can change it by entering the following filter in your functions.php. Change the h3 to an h1 or h2 etc. to adjust the size. That's it! Of course, if you have company videos, you should be optimizing those with our Video SEO plugin! This is an example on how to change the name of a label for the contact details.